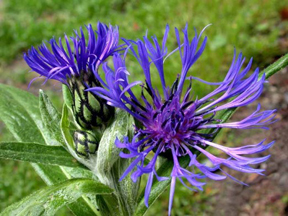 Another great source of blue flowers, Centaurea or "mountain cornflower" or "bachelor's button" have the easy, casual growth habit of the wildflowers they are. All types of these flowers are prolific nectar producers that attract butterflies. After blooming, like a lot of wildflowers, the plants get somewhat weedy looking and benefit from a cutting back by a third to a half to keep them tidy. The cornflower-blue, fringed 3 inch blossoms of this flower attract butterflies like magnets in the garden. Montana series Centaurea is a low, spreading one and it will self-seed prolifically if it is not deadheaded.